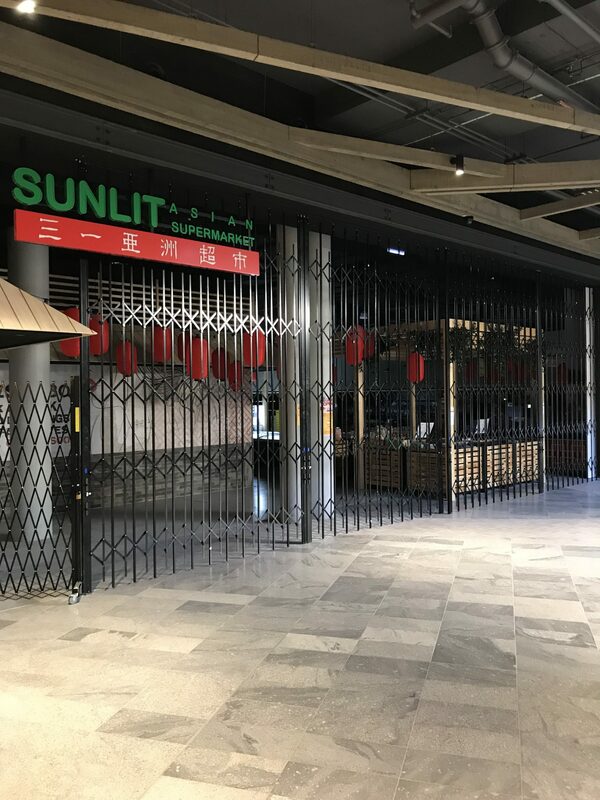 Australian Trellis Door CO (ATDC) is proud of its involvement in supplying many of their latest 2018 design shopfront door closures at this new QLD Shopping Centre. This is the second in a series of 3 press releases on these projects at this shopping centre redevelopment. Pictured is an installation for Sunlit Asian Supermarket which is a leading and rapidly expanding Queensland based Asian grocery brand.The doors were specified by Blackbox Retail Projects and the project managers were Burleigh Heads based O’Flynn Builders. This was one of a number of projects at this site which incorporated an innovative door stack storage minimizing technique (termed the S07-2 side-by-side) which involves a parallel top track arrangement. This has the effect of reducing the side compaction of the door closure to as tight as 8% of the opening span being secured which is just a fraction of the daylight opening width.And with the use of multiple intermediate up/down locking mechanisms a seamless lock up solution is provided. Numerous tenancies at this site also incorporated the parallel top track arrangement in a curved configuration which enabled the door closures to traverse tight radius curves,S-bend curves and even angular shaped openings. For further information on ATDC’s latest designs in commercial door closures visit their site on https://www.trellisdoors.com.au/products/commercial-security or contact them toll free on 1800657435 from anywhere in Australia.